Dentistry is a career for some, but in our practice it is more a calling. We are 3rd and 4th generations of dentists. My name is Mark Lee Speck, D.D.S. I practice the Art and Science of dentistry at my office located near Greenway Plaza. I am a third generation dentist and native Houstonian. My grandfather, father and two brothers are dentist. My academic life includes Lamar High School, University of Houston, and University of Texas Dental School. 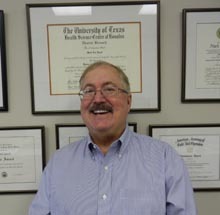 I am an Active member of the American Dental Association, Texas Dental Association, Greater Houston Dental Society, the Academy of General Dentistry , Academy of Cosmetic Dentistry and American Academy of Gold Foil Operators. I am enjoying over 30+ years of marriage and my three children. My hobbies currently include hunting, fishing, building and flying R.C. planes. In an effort to stay skilled in the latest techniques and knowledgeable of the newest technology I participate in and attend numerous continuing education programs throughout the year. These are university based programs and ones endorsed by the Academy of General Dentistry. I earned my Academy of General Dentistry fellowship in 2013. I am experienced in all aspects of general dental care. I have a special awareness of your cosmetic needs. I also provide non-surgical treatment of the gums, home bleaching trays, TMJ splints. I see patients of all ages. Having three children of my own, I know how important it is to instill proper health care habits, as well as ensure their first experience at the dentist be a "happy visit". Dr. Rachel Speck is a 2014 graduate of the University of Texas School of Dentistry at Houston with a long history in the field. 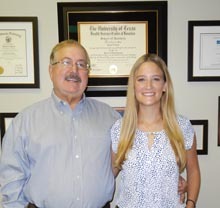 She is a fourth generation dentist that grew up in the Houston area, working as both a registered dental assistant and front office manager for Dr. Mark Speck. She gained valuable experience working in a real dental office between undergraduate semesters at Texas Tech University where she studied Psychology and Chemistry. During her education, she was an active member of the Pre-Dental society and the Texas Tech Goin' Band From Raiderland. She is passionate about the field of dentistry and diligent about keeping up with the latest advances in dentistry. She is a member of the American Dental Association, the Texas Dental Association, the Academy of General Dentistry, and the Greater Houston Dental Society. Dr. Rachel Speck is currently pursuing her Fellowship degree in the Academy of General Dentistry. To help out with the community, Dr. Rachel Speck volunteers with Give Kids a Smile program and Texas Mission of Mercy.